There is no doubt that website security is vital. The key to protecting yours and your user data is by enabling an SSL certificate. This changes your web link from the standard HTTP to HTTPS (Hyper Text Transfer Protocol Secure.) HTTPS is the protocol over which data is sent between your browser and the website that you are connected to. Sites that utilize HTTPS have data that is encrypted and secured. Both *.coffeecup.com and custom domains hosted with S-Drive can easily apply this feature within the S-Drive Dashboard. Unlike other service provider who charge hefty prices for SSL certificates, with CoffeeCup they are FREE with all paid S-Drive accounts. Go to the Domains dashboard and enable the SSL Certificate for the domains you want. Wait about 15-20 minutes for the certificate to apply across servers worldwide. To check the certificate is working after the wait period, visit your domain prefixing it with HTTPS within any browser. For example https://www.my-website.com. If it shows a lock next to it in the address bar then the set up is good. 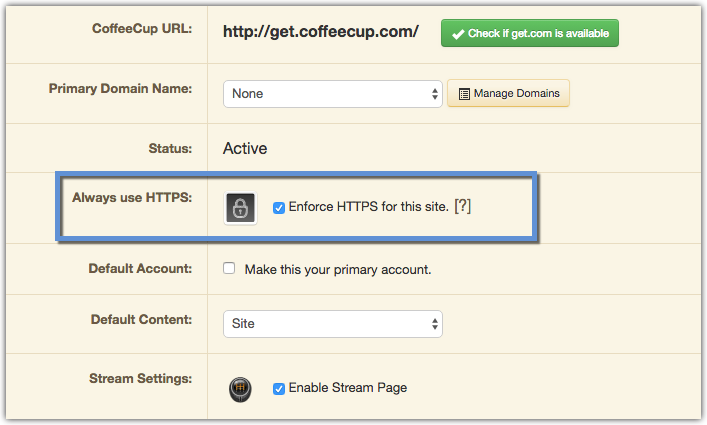 Visit your site settings and check the Enforce HTTPS for this site checkbox. You can find these settings at https://www.coffeecup.com/sdrive/dashboard/settings/. Important: You will need to update any images and files that use an absolute link (HTTP://). These links will need to be changed to a relative link or manually changed to HTTPS.